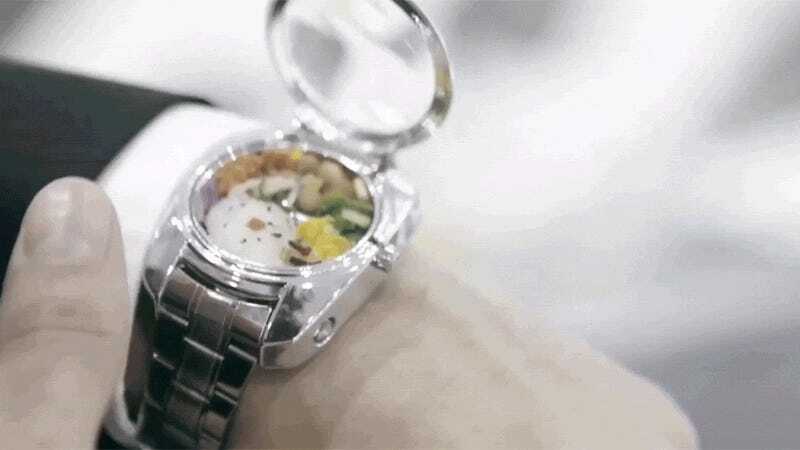 A watch filled with little food is way more impressive than a watch that lets you check Facebook. Too bad the Bento Watch isn’t for sale! To show off its agriculture skills, Kyoto-based Takii Seeds created this clip (read: publicity stunt), roping in a master watch craftsman to design the timepiece, a plastic surgeon to cut the vegetables, a famous chef to cook the tiny food, and a diorama hobbyist to put everything in this 30mm-diameter wrist bento. It’s teeny-tiny, but so cute and packed with vitamins and minerals. The result is a one-of-a-kind creation, which will never be on sale, but which is a definite want. That is, as long as the surgeon, the cook, and the diorama dude prepare your bento each time. And how about those pop-out chopsticks? The Apple Watch can’t do that. You can’t eat what’s inside it, either. Well, you can, but don’t.